BELLY DANCING has simple basic steps and body movements which, once mastered, make the dancer feel beautiful and confident, inducing a feeling of spiritual and physical well-being. 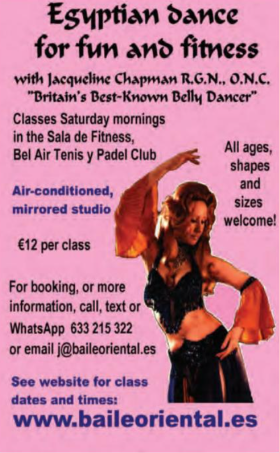 BELLY DANCING will discover the new you both mentally and physically, as well as being a tremendously enjoyable way of keeping fit. Jacqueline Chapman is acclaimed by the national media as Britain’s leading professional belly dancer, choreographer and teacher. She has won national and international acclaim as a quintessential English dancer who is able to perform and choreograph with authenticity and genuine feeling for this Middle Eastern art-form.